As we now know, the new accounting standard for operating leases take effect at the end of this year, and its primary consequences are all about the balance sheet. Money you owe in operating leases will soon appear there on the liability side, and will be offset by a corresponding “right of use” asset on the asset side. The balance sheet grows, but stockholder equity stays the same. That will change a few financial ratios here and there, but the balance sheet consequences overall are generally easy to understand. So, um, what about the income statement? The tricky thing is that any asset listed on your balance sheet (goodwill, financial instruments, inventory, and so forth) is subject to impairment. Operating lease assets will be no different. We don’t know how often operating lease impairments will happen, but they will happen sometimes. And when they do — boom, negative earnings surprise! We already see this occasionally among the few companies that already have operating leases on their balance sheet. Take a look at this filer, who shall remain nameless today. Could these impairments even be used for earnings manipulation? Well, maybe. Consider this scenario: A company is already having a bad quarter, and then includes a big ol’ lease impairment to boot. Sure, the loss looks bad in the moment, but lease assets amortize over a set schedule. If you impair the asset today, the future amortization per quarter will suddenly be lower, thus making future quarters look better. 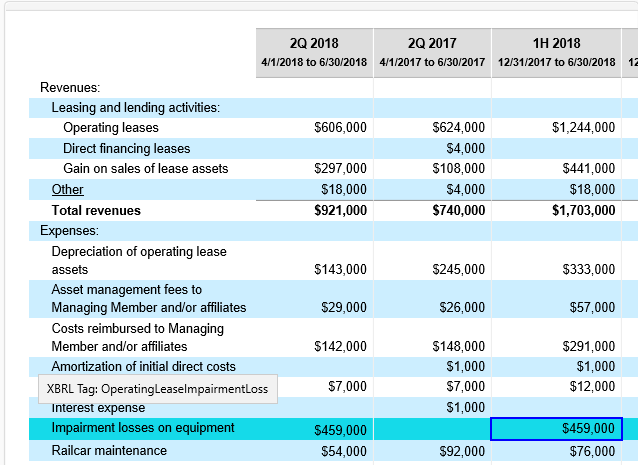 So net income and EPS numbers might look better, but only because you’re fiddling with your lease costs rather than any improved performance from operations. Then again, dickering with the value of assets to make the bottom line look good is a time-honored tradition in financial reporting. Maybe the operating lease standard isn’t such a new thing under the sun after all.